Successfully Added Bluetooth Speaker Desk Light - 3 Lighting Modes, 200 Lumen, Bluetooth Speaker, 70dB, 360-Degree Sound to your Shopping Cart. Featuring an intergraded Bluetooth speaker, this LED desk light allows you to light up your room and listen to your favorite tracks at the same time. Its bright LED light features three different lighting modes, ensuring that you’ll always have the right type of light available. Whether you’re reading a book, playing your laptop, or watching TV – this LED lamp is always at your side to provide you with the needed light in the darkness. Its intergraded Bluetooth speaker additionally allows you to pair it with your smartphone, tablet, or laptop – letting you enjoy your favorite songs at any given moment. Capable of playing those all-time classics and emitting a smooth LED light – this smart home accessory is guaranteed to set the right mood and atmosphere at any occasion. Emitting up to 200 lumens, this LED desk light can be used efficiently to light up a significant area. It additionally features an energy efficient design, allowing you to enjoy its light without unnecessary wasting any electricity. With its sleek and stylish body, this smart LED light is the perfect accessory for any modern household. Whether you use it as a reading light in your living room, or as a night light at your bedside table, this LED desk lamp is sure to meet your demands. Equipped with a 7W speaker, this LED light is capable of playing music in stunning quality. Reaching up to 70dB, you will be able to blast those speakers away and enjoy your favorite songs to their absolute most. 360-degree sound furthermore increases your overall audio experience, guaranteeing that no matter where in the room you’re located, you’ll always enjoy the highest level of audio quality. 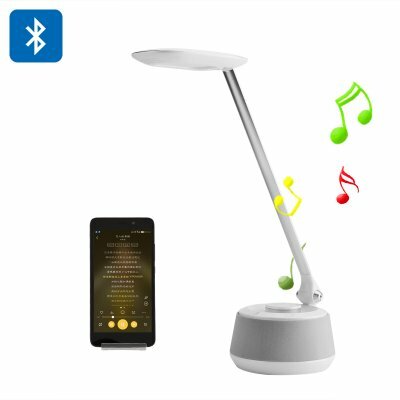 Simply pair this smart LED light with your Bluetooth enabled device and you’ll be able to listen to all those songs saved in your music library. Whether you like to enjoy a song while relaxing at home, or are having a small get together with your friends, this 70dB Bluetooth speaker is guaranteed to set the needed atmosphere with its amazing audio quality. This LED desk light comes with a 12 months warranty, brought to you by the leader in electronic devices as well as wholesale electronic gadgets..
Arabic: - السماعة بلوتوث - Chinese Simplified: - 蓝牙音箱 - Czech: - Bluetooth reproduktor - Danish: - Bluetooth Højttaler - Dutch: - Bluetooth luidspreker - French: - Haut-parleur Bluetooth - German: - Bluetooth-Lautsprecher - Hebrew: - רמקול Bluetooth - Hindi: - ब्लूटूथ स्पीकर - Italian: - Altoparlante Bluetooth - Japanese: - Bluetooth スピーカー - Korean: - 블루투스 스피커 - Malay: - Yang di-Pertua Bluetooth - Norwegian Bokmål: - Bluetooth høyttaler - Romanian: - Difuzorul Bluetooth - Russian: - Динамик Bluetooth - Spanish: - Altavoz Bluetooth - Thai: - ลำโพงบลูทูธ - Turkish: - Bluetooth Hoparlör - Vietnamese: - Bluetooth loa. This is probably one think witch works with no faults, I like it, thanks.